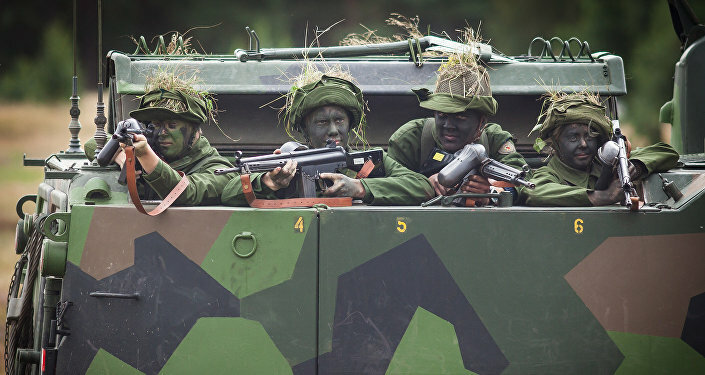 As Sweden prepares for its largest military exercise in decades, the formally-still-non-aligned Nordic country's foreign policy is triggering all the more reproach at home. Critics suggest that the exercise, which features NATO heavyweights, sends out a wrong message about Sweden's non-alignment and jeopardizes is security. Amid the last preparations for Sweden's Aurora 17 exercise, which is being touted as Stockholm's largest in 25 years, criticism is mounting on the home arena. It is also the first time the controversial Host Country Agreement has been applied, ushering it troops from six NATO member states, including the US. Among other things, US Patriot missile systems will be placed on Sweden's Gotland Island, which Swedish military experts previously identified as an entry point for "Russian aggression." In an article penned by Left Party defense policy spokesman Stig Henriksson in the Swedish daily Svenska Dagbladet, Sweden has been described as "in the process of outsourcing its capabilities" to the detriment of its security. As if summarizing Sweden's mounting anti-Russian paranoia, Aurora 17 features a fictitious enemy, whose borders mysteriously coincide with Russia. This is the more striking given the fact that Russia is simultaneously carrying out a major exercise, Zapad 17, jointly with Belarus. According to Henriksson, this increases the risk of dangerous incidents and undermines Sweden's security in the long run. According to Henriksson, the exercise in general sends wrong signals about Sweden's freedom of alliance, which still happens to be the foundation of the Nordic country's foreign doctrine, albeit only in name. Henriksson pointed out that Sweden actively challenges Russia through its growing involvement in NATO affairs and emphasized that this trend occurs in other Nordic countries. "Even Norway is taking steps in the same direction; In Værnes, only 70 kilometers from the Swedish border, a main base for the US Marine Corps is planned. This would violate Norway's earlier policy of disallowing permanent NATO bases on its territory, and the proposal has met strong protests from the Norwegian public," Stig Henriksson wrote, assuming that Sweden might be preparing to lodge foreign troops as well. ​Henriksson's Left Party advocates exactly the opposite. "Based on real freedom of military alliance and a strong Swedish defense, [Sweden] should pursue an active diplomacy within the framework of the UN and the OSCE. Sweden should also take disarmament initiatives and promote confidence-building measures and stimulate contacts at various levels," Henriksson wrote. Furthermore, the Left Party requires that the Host Country Agreement be scrapped. "Aurora 17 must become the first and the last time the agreement is applied, and the struggle for peace, disarmament and détente shall be intensified," Henriksson wrote, stressing nuclear threats posed by North Korea, the US and Great Britain. Earlier this year, Aurora 17 ignited vocal protests across Sweden. "The security situation in the world is getting worse and worse, and it's not the right moment to arm oneself. We have to increase civilian cooperation, not military. Peace is reached thorough talks, diplomacy and cooperation not arms," grassroots activist Lars Evert Holm from Gothenburg told the Swedish daily Göteborgs-Posten in August. "Formally we are non-aligned, but our neutrality is threatened," he added. According to 2016 figures from the SOM Institute, NATO supporters outnumbered NATO opponents, while a majority of Swedes wanted the country to retain its freedom of alliance. Previously, Swedish writer and columnist Lars Wilderäng noted that Sweden is neither neutral, nor non-aligned anymore. In 2009, the EU Lisbon Treaty entered into force, which compelled Sweden to help its EU allies with all available measures, if attacked. ​Aurora 17 will take place in September, incorporating sea, land and air units from all over Sweden. About 20,000 troops are set to take part, including some 1,500 soldiers from the US, 270 from Finland, 120 from France and between 40 to 60 from Denmark, Norway, Lithuania and Estonia each. The total cost of the exercise has been estimated at $73 million.